If using an M3U-series tester, use CB25 when regularly testing cables longer than 10 feet, when testing cables with a large surface area shield or conductor, or when working in a high static environment to guard your CableEye tester against damage from electrostatic discharge. On each board, 64 transient suppressor diodes especially designed for fast switching divert any overvoltages to ground before damage to CableEye's electronics can occur. 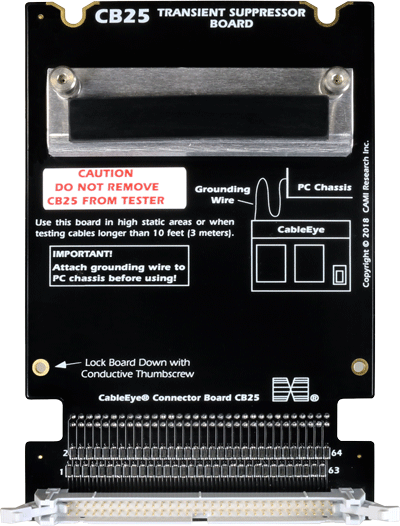 The CB25 mounts to the CableEye tester like any CB board and is physically secured with supplied stainless steel thumbscrews. 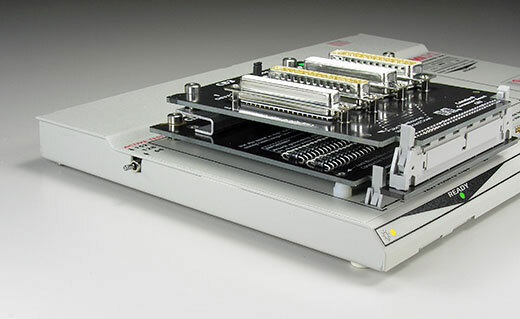 Attach the CB boards you use directly to CB25 as shown in the 2nd photo below. Required for CableEye M3U series models only. Set of two boards with ground bypass wire, thumbscrews, and setup instructions.